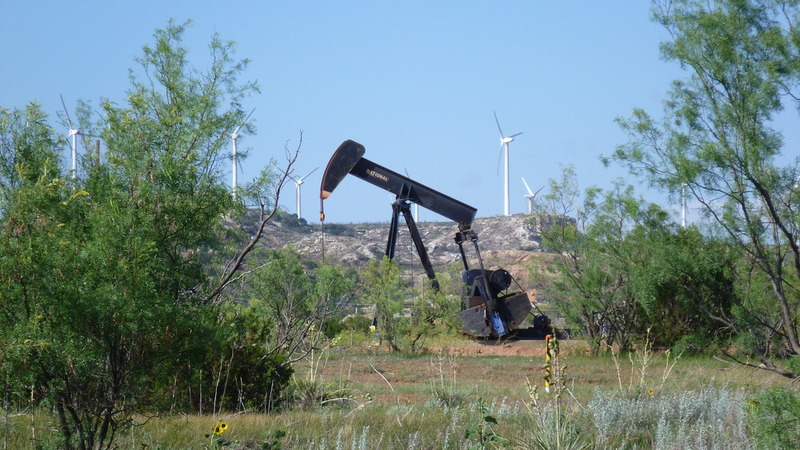 Then we were confronted with a number of contrasts – large cattle feed lots between hundreds of oils pumps pumping away next to large wind farms (and we're talking about 100+ turbines per cluster!). Then there was pristine nature broken up by massive industrial complexes (in particular around Houston), and by massive I mean half a dozen of refineries and chemical plants as far as the eye could see. 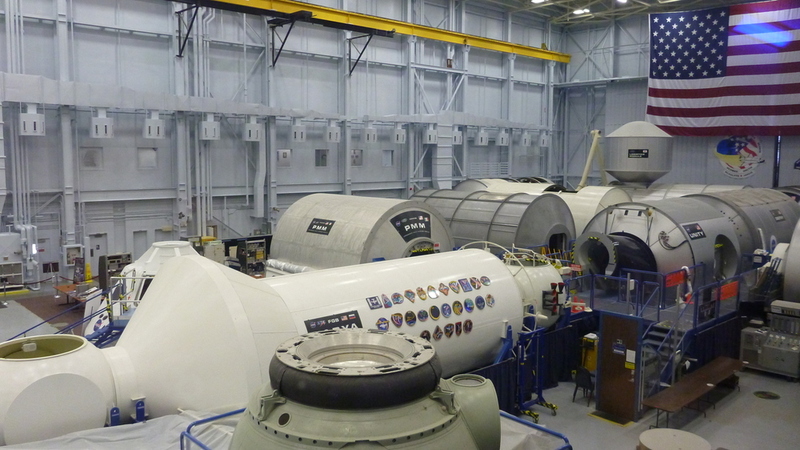 Then there was the smell. With high winds carried the smell of thousands of cattle mixed in with long bursts of oil from the oil wells…the smell was confronting indeed. 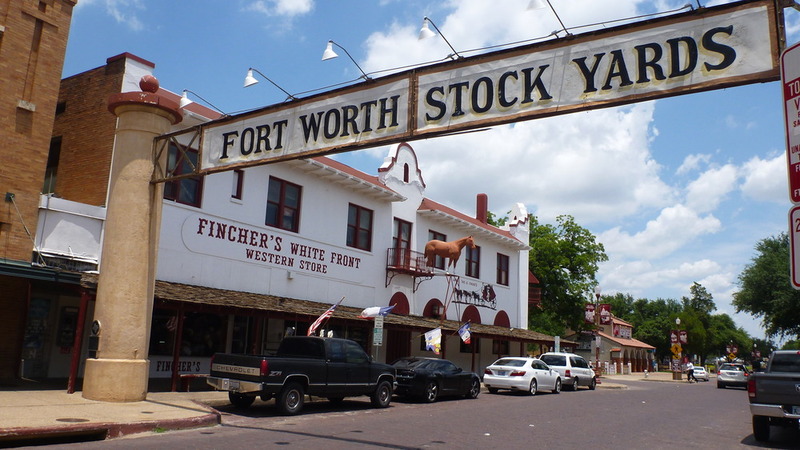 Fort Worth was a key destination for us, since it is home to the first official BMW workshop since Colorado, and we booked in our bikes to fix the waterpump and the master brake cylinder. We arrived in the late afternoon at the hotel and CB decided to quickly swing by the work shop to check if everything is in order and to confirm our spot in the workshop. Thank god he did, because it turned out that the spare part order that we placed over the phone a week ago got stuffed up and the shop forgot to include the water pump. Frantic phone calls were made to track down the relevant part, and we ended up placing an express order with the BMW distributor so it would be there in the morning. Guess what, that didnt happen. Disgruntled by the incompetence of the shop, CB took the master brake cylinder for the Dakar and fixed her up by himself in front of the hotel. Job done in less than 30 min – we were quoted 1 hour by BMW (meaning 100 bucks plus tax) for the same job… Back to the waterpump: as we arrived at the BMW dealer the next morning to drop off 'Wobbles' the said part hasn't arrived. Two hours later we finally got hold of the manager, who was very apologetic and even offered a ride on his R1200GS and free accommodation at his bachelor pad to compensate for the delay. We agreed to let the mechanic to commence the job by stripping down the bike and then wait for the pump to arrive the next day, so the job can be completed first thing in the morning. Now the irony of the entire saga: late afternoon we received a call from the shop telling us that the waterpump arrived at lunch time and the job is done. In addition, someone found a second pump that was put aside for us when we ordered the parts! Total case of miscommunication. Anyways, bikes are now back in full operating condition. 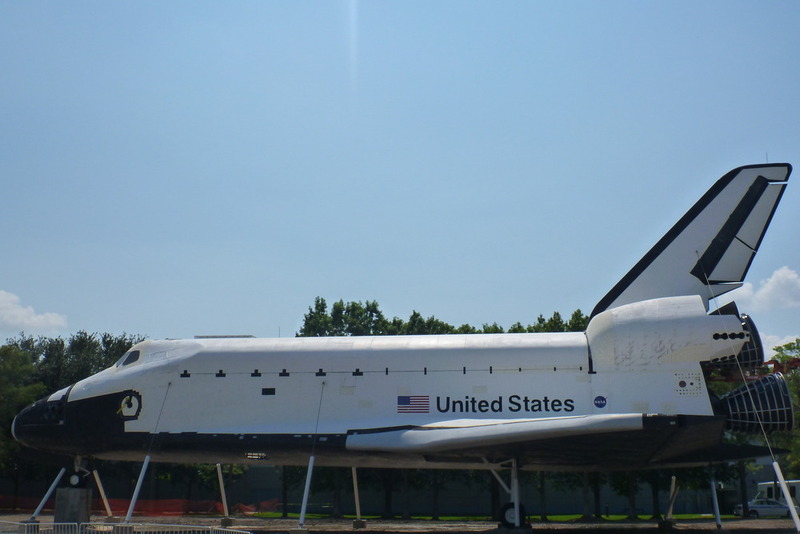 We raced out of Houston the next day but not before CB lost one of his earplugs for the helmet intercom and DB lost her credit card, NZ drivers license and a recently purchased Golden Eagle Pass to all national parks in the USA somewhere between Houston and the Louisiana border. 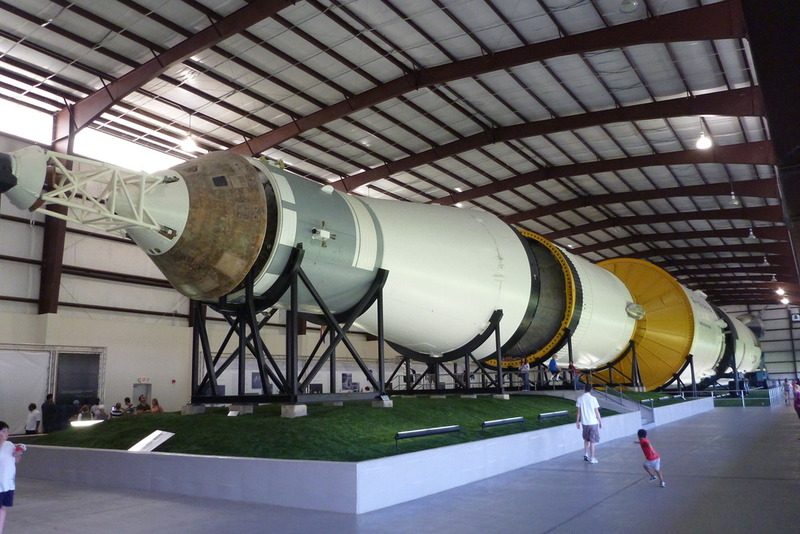 So, bottom line is that Texas was rather an costly leg of our trip and left an unpleasant aftertaste in our mouths (which also could originate from the last chemical plant we passed). Leaving the green lush landscape of Colorado behind, we continued our trip south-east into New Mexico a State full of interesting history: not only was the first nuclear bomb – Trinity – developed here (in Los Alamos) during the Second World War, it was also tested here a few miles down the road at the White Sands Missile Range close to the Mexican border. Further, New Mexico was also under Spanish and Mexican reign before joining the Union as 47th State in 1912. It is also the only State that ever had a successful revolt of its indigenous people – the Chimayó Rebellion in 1837 (http://en.wikipedia.org/wiki/New_Mexico). But that's enough history. We drove through the HOT New Mexican desert for nearly 500km, hot, tired and dehydrated till we made our next stop Santa Fe (http://en.wikipedia.org/wiki/Santa_Fe,_New_Mexico). 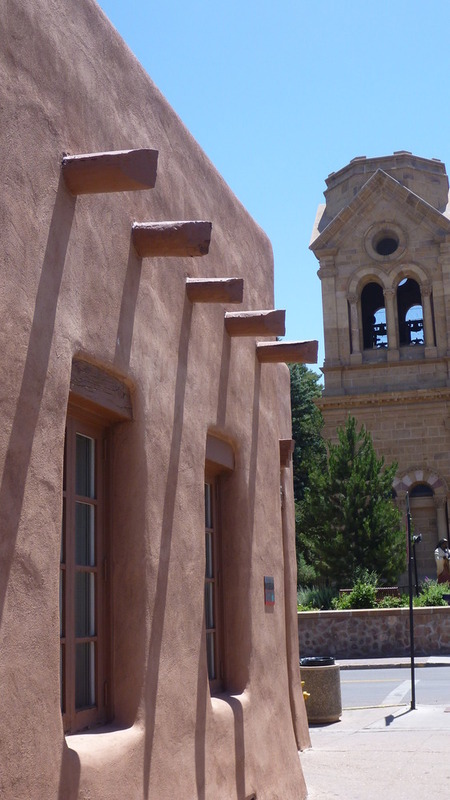 Santa Fe was a pleasant surprise indeed. 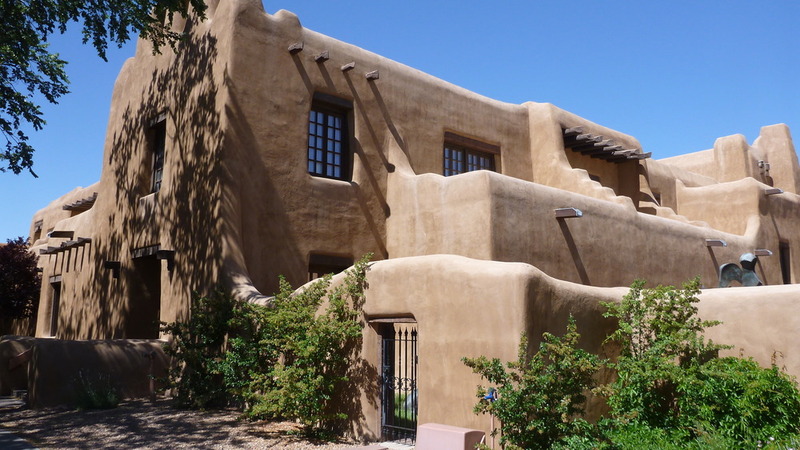 The city is famous for its art culture and architecture and in 1957 the city council passed an ordinance prescribing a 'Pueblo style' of architecture to all new and rebuilt buildings in the downtown area, resulting in amazing streetscapes with flat roof houses, lots of wood and mud-coloured stucco facades. There is also a density of art galleries only surpassed by New York city. Wondering through the historic city centre was a real treat – DB fell in love with the place. There were tons of little cafes, al-fresco restaurants and markets tucked away in some side alleys or courtyards. Indigenous artists were flogging off their stuff and the Cathedral Basilica of Saint Francis of Assisi, which was built in 1869 and worthwhile looking at. We have been to many Catholic cathedrals in Europe but Spanish/Latin American churches and cathedrals are full of colour and sparkle. 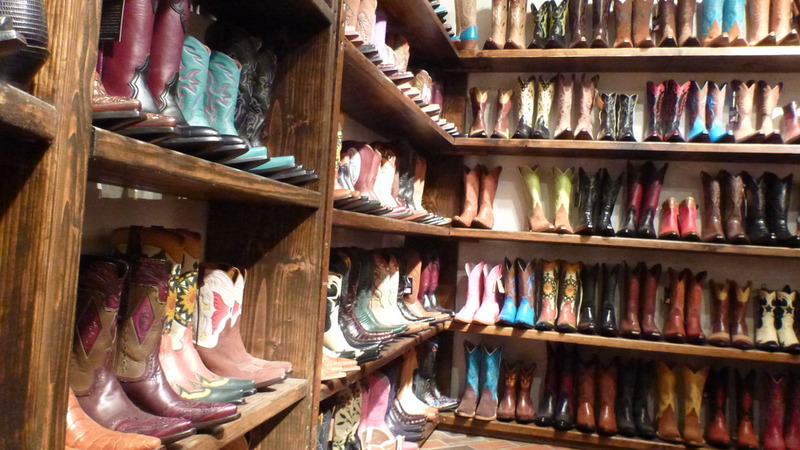 The highlight though was stumbling upon a boot shop selling handcrafted cowboy boots. The owner was a real character, and we quickly engaged into an interesting conversation on boots and life in general. DB managed to convince me that we HAD to buy some Indian art…hey the official Team Berg policy is "you carry your stuff and i'll carry my stuff". Surprisingly she managed to find space for these three rather interesting totems we picked up at the Museum of Native American Art. 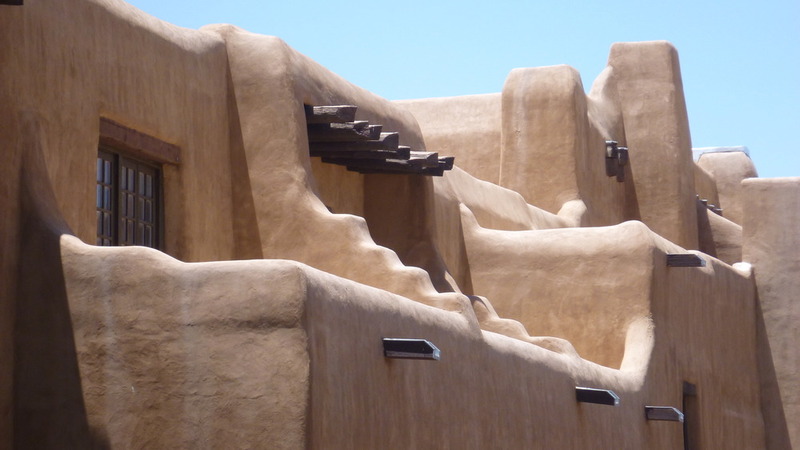 We could have easily spent much more time in Santa Fe but riding with a stuffed front brake wasn't fun or safe so we pushed ahead into Fort Worth, Texas for some much needed repairs. Day two in this lovely little historic town, Mancos began by having breakfast at the local bakery specialising in only yummy organic and fresh produce. DB's bike was due to be finished by lunchtime so with time to kill we took a quick walk around the small main street meeting the local art curator and milliner all who highly recommended we make the trip up to Mesa Verde National Park so once we got back DB's bike, Wobbles, we made our way. 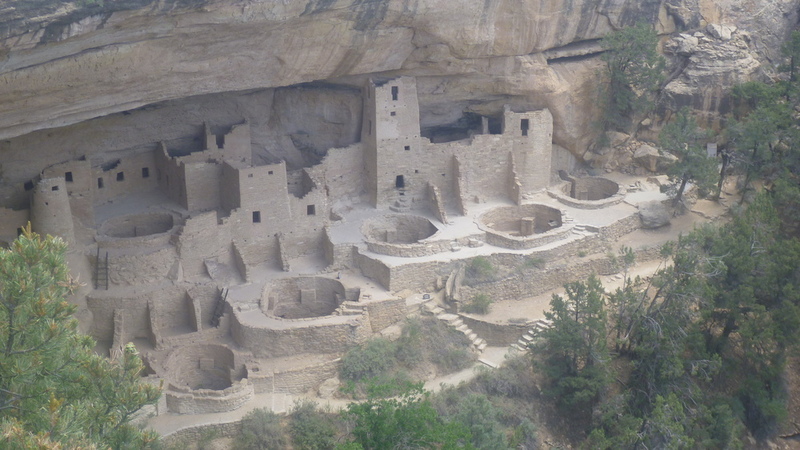 Mesa Verde National Park is located about 20 miles from Mancos and the drive through the park was as exciting as seeing the old Anasazi ruins – winding sweeping roads through pine and juniper forests climbing up to 12,000 feet was exhilarating. Once we entered the ruins feelings changed from excitement to peace and calm. The ancient ruins were breathtaking. Built into natural cave and ledge shelters eroded into the sides of sheer vertical cliffs are these surprising village ruins. 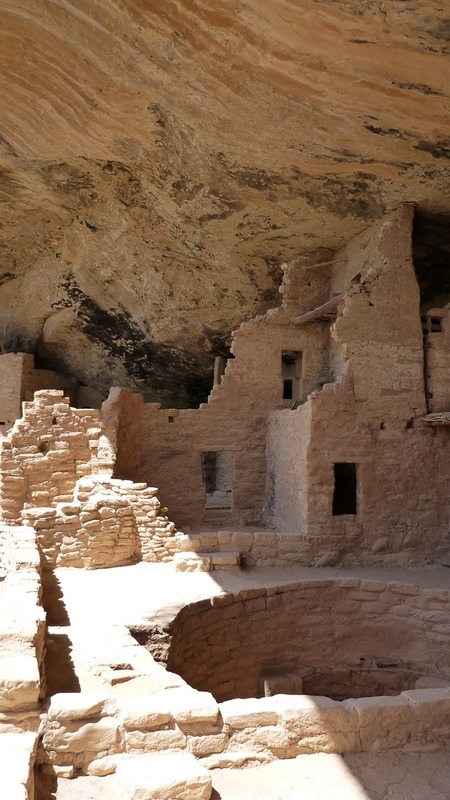 The Anasazi's were ancient peoples who lived in the Colorado-New Mexico region. They initially built pit houses on the top of these plateaus where they farm but they then moved down the cliffs into the ledges. Over time as the climate changed these people moved down these high plateaus into the valleys below. The ancient ruins where not re-discovered till the late 19th Century by two cowboys. 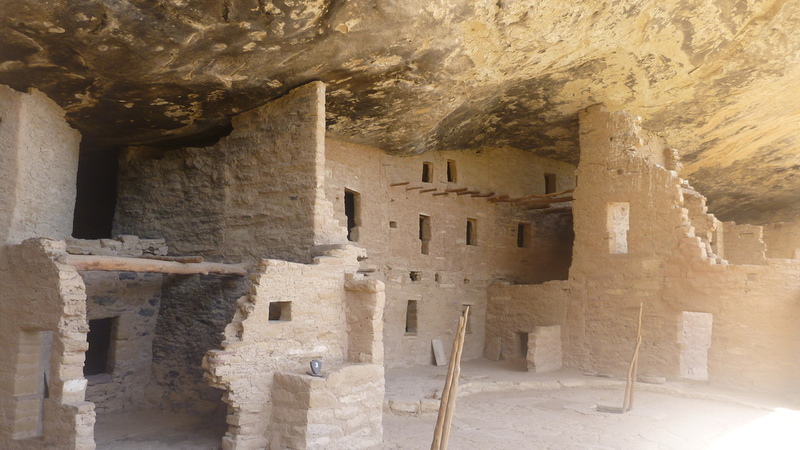 Stumbling on to this national park was a complete accident, if the bikes hadn't broken down we would have blasted through the lovely historic town of Mancos as well as Mesa Verde and so the lesson here is that a break down is never really a bad thing. 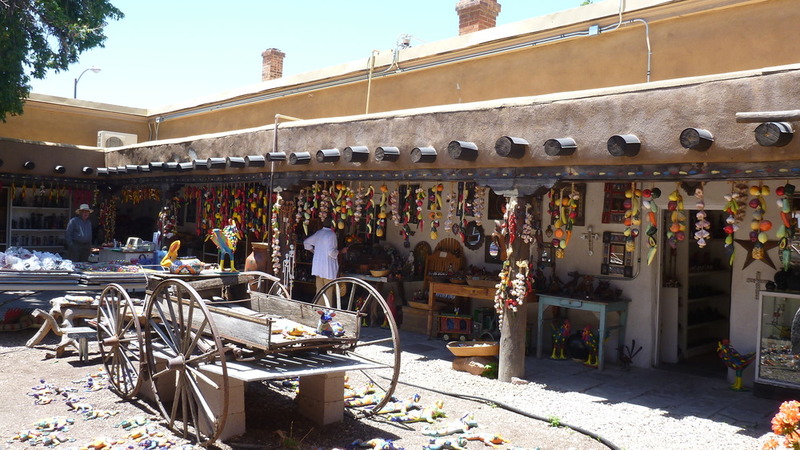 Next we head back down into the desert, into New Mexico and into Santa Fe – we can't wait to find what awaits us there! As every traveler knows the best part about traveling is stumbling upon a hidden gem, be it a secluded beach, a tiny hole in the wall sell the best coffee or in our case a wee town that we never considered even stopping for fuel. A chain of unavoidable events lead us to the tiny historic town of Mancos sitting on the edge of a highway and boy are we glad that they did. As we left the scorching heat of the Utah desert behind us we headed towards Colorado, a route to get us to Dallas as quickly as possible. The reason for such urgency was because both our bikes started to fall apart. The mighty Dakar came to a grinding halt on the main street of Moab, Utah. Jeff and CB started to perform open heart surgery right there on the street in front of an organic gelato shop and massage centre which drew a small audience that Jeff and CB seemed to enjoy. After bleeding the front brake the Dakar limped to the campground and Jeff and CB continued to work on all the bikes – our poor machines had worked extremely hard traveling almost 500km in 43 degree Celsius heat. DB’s bike, affectionately named “Wobbles” due to a damaged head steering bearing making it wobble in first and second gear, now also started to leak water and oil – indicating the water-pump seals are failing. With no one but a BMW dealer wanting to touch the machines we were at a conundrum – do we ride two hours to Mancos, Colorado and wait a week till the bikes are fixed OR travel to Dallas in 5 days and get the bikes fixed there??? We decided to shelve the decision till the morning as we were all tired, dehydrated and suffering from mild heatstroke after a full on day of riding. Our campsite was awful – a dust bowl with rocky tent sites and guests cooking their dinners on smokey coal BBQs. DB said ‘f-that’ and went looking for a hotel – it is best not to argue with her at times like that. 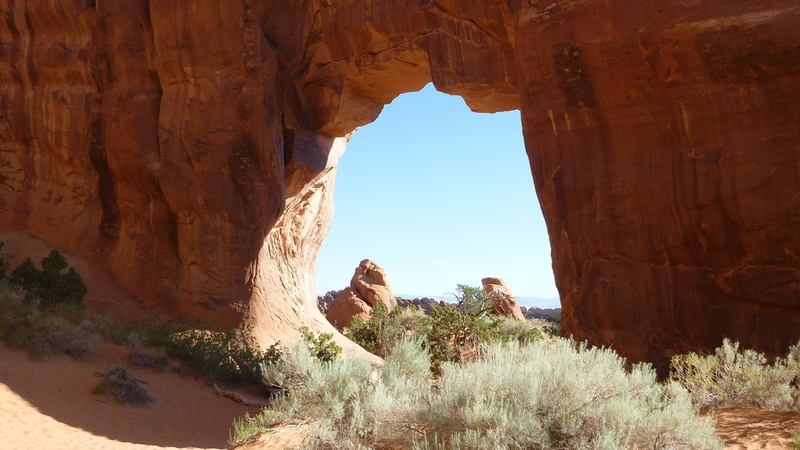 The next morning we all decided to take a day off and check out Arches National Park. 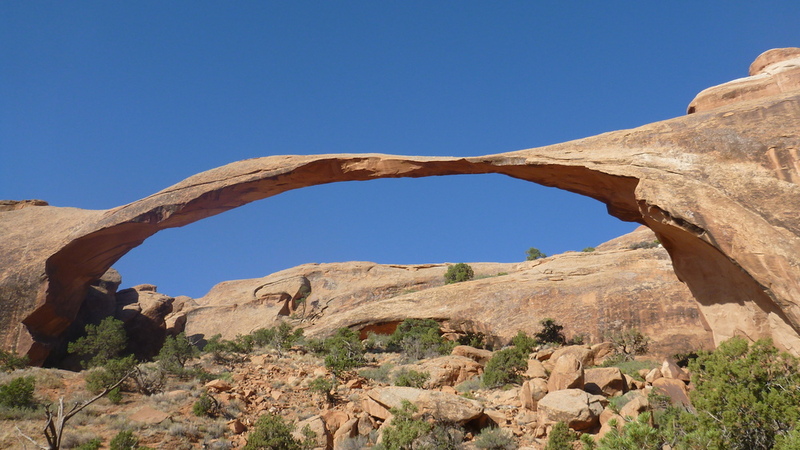 The plan was to start early the following day to beat the heat and check out the arches. We just made it through the entrance of the NP as the aforementioned front break caused some unwanted braking action. So we returned to the hotel to swap bikes for safety reasons just to find out that Jeff and Catha turned around as well with an empty tank… On the second attempt to see the arches it was truly past 10am and the heat was rising. 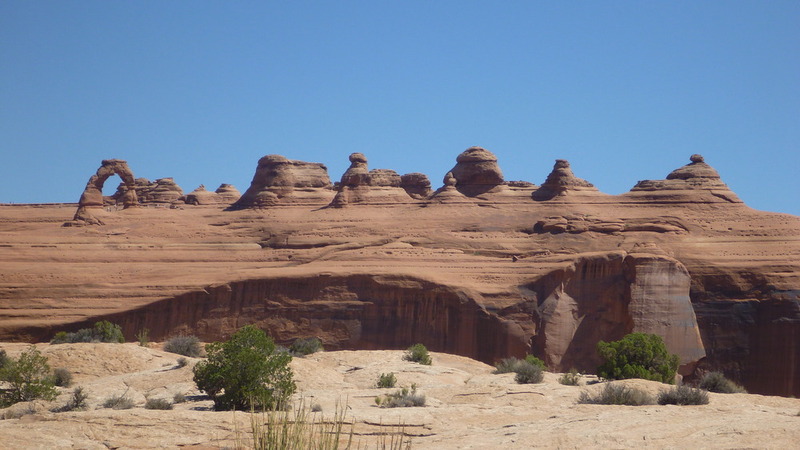 We managed to look at a few amazing sites, such as the Balanced Rock and some other formations, but at noon we called it quits as the temperature became unbearable. 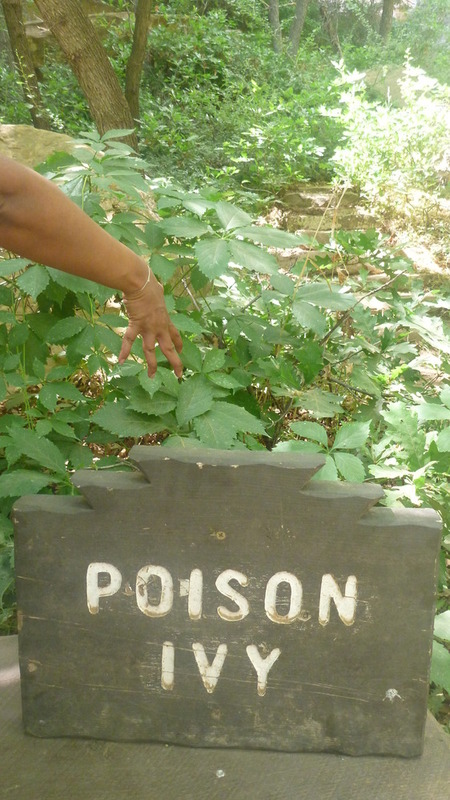 Jeff and Catha soldiered on and went on a 5 mile hike in the scorching heat. 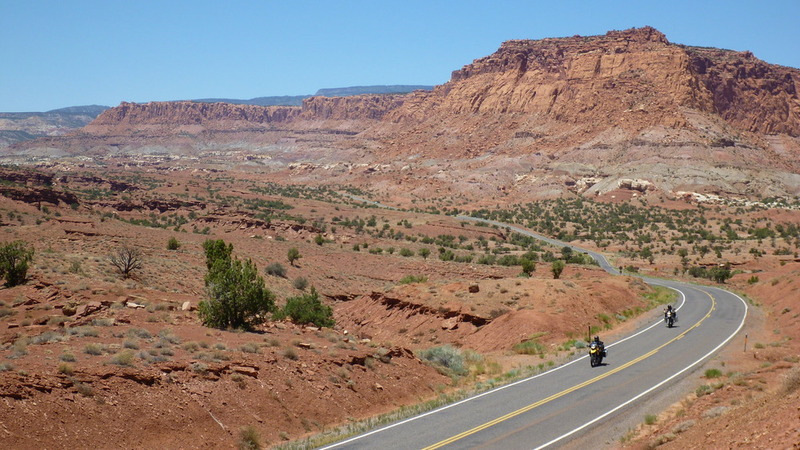 As we debriefed in the evening, we decided to stay another night at Moab and attempt the hike the next morning while Jeff and Catha jumped on their bikes after dinner to clock up a few more miles before pitching a tent under the desert sky full of stars. 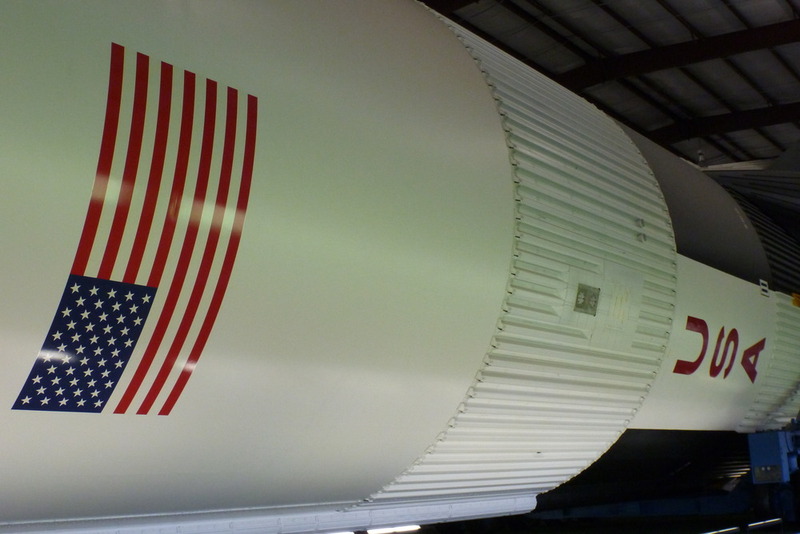 They still need to make it to Phoenix, AZ by Saturday morning, as Jeff needs to return to work in Alberta, Canada. 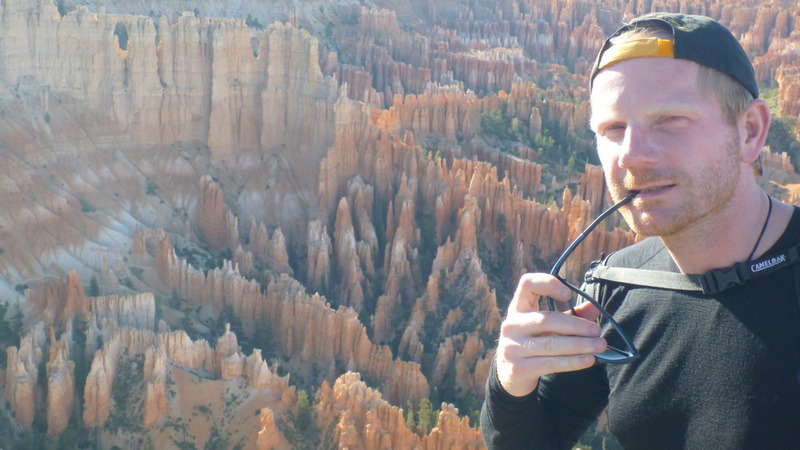 Leaving the deserts of Utah behind us, Team Berg continued their journey towards Colorado. Crossing the State border was like entering a different country – green, lush and the air smelling of pine right into the surprising little town of Mancos. 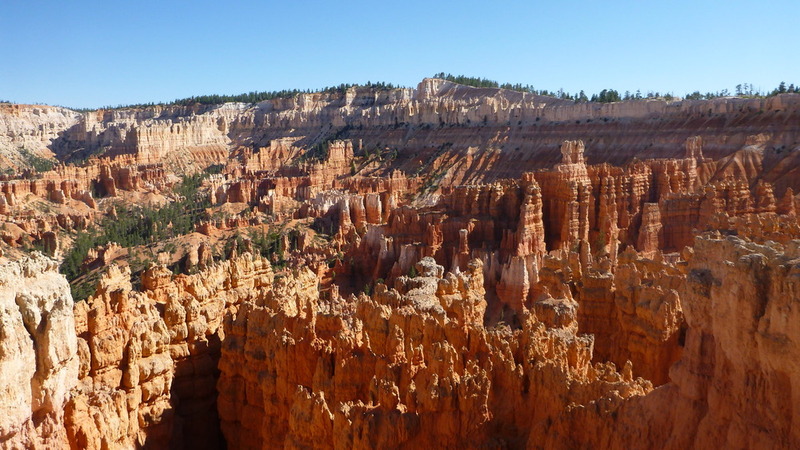 Not that we haven't seen enough canyons on this trip so far, however Bryce Canyon is promised as a prime natural spectacle not to be missed by the concerned traveler. 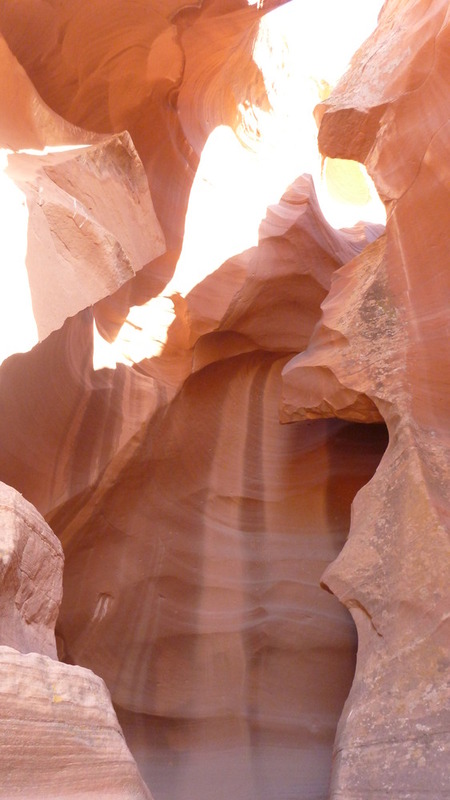 Its red sandstone formations, carved by erosion over millions of years, provide breathtaking views. 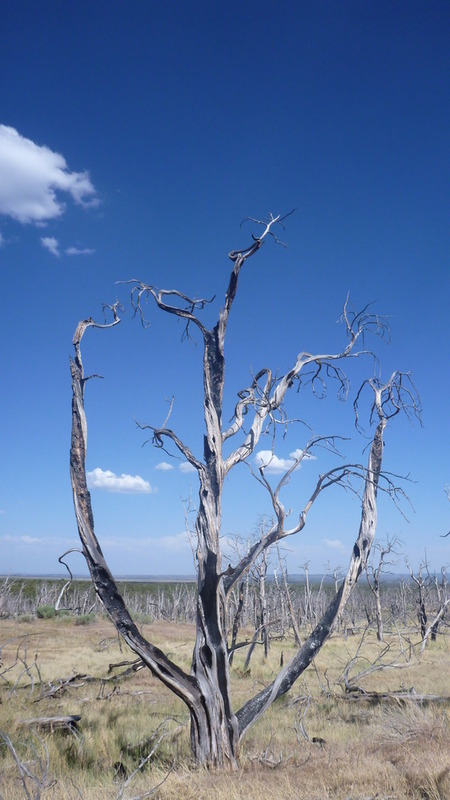 We also learned that this part of Utah is frequently subjected to thunderstorms, and evidence of lightning struck trees were all around us. Finding affordable accommodation in this rather popular tourist area was a different story. Since we arrived rather late in the day, a mild sense of panic arose as NO signs were increasingly switched on in front of the VACANCY bit. But in the end it was all good – we secured 2 wee cabins for Team Berg and Jeff and Catha, and as we found out that decent beer was available in the nearby restaurant the nerved started to settle. 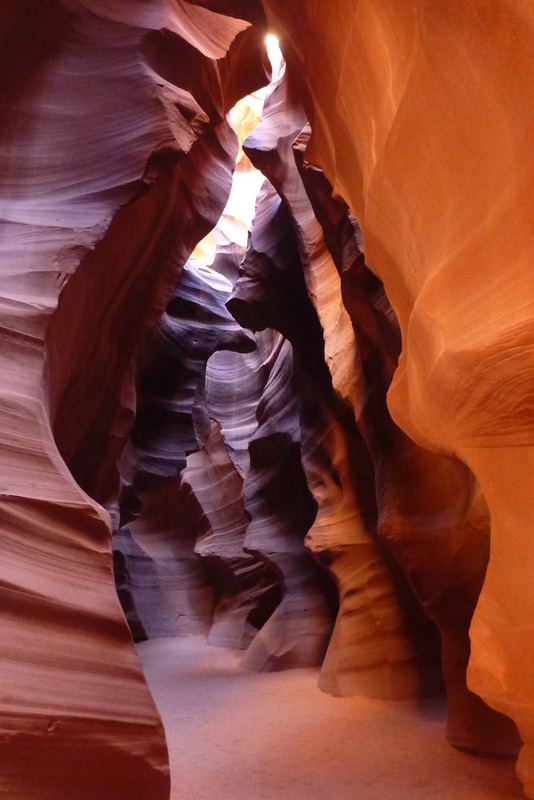 Until recently, we have never even heard about Antelope Canyon, but our friend Anne in Cleveland highly recommended to visit this place, to a point that she threatened Jeff physical punishment if he wouldn't take us there – so he did! 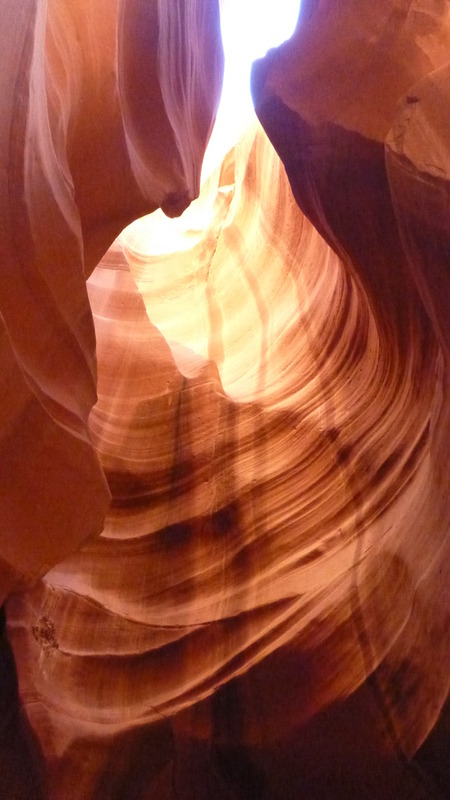 Antelope Canyon isn't assessable without organising a tour as it is on Native Indian land. 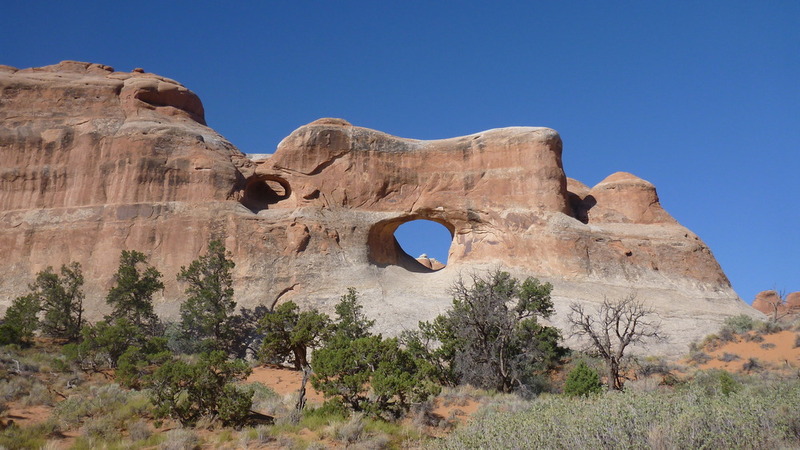 We booked our tour company run with a local Navajo tribe business. 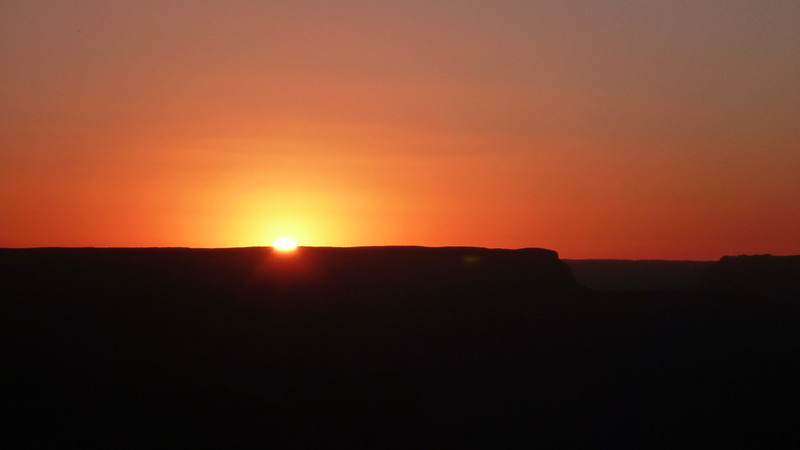 The tour started on a back of a converted V8 pick-up truck which hammered through the town and into the desert and over over a soft sand dry river bed towards the canyon entrance in the middle of nowhere to the delight of CB. 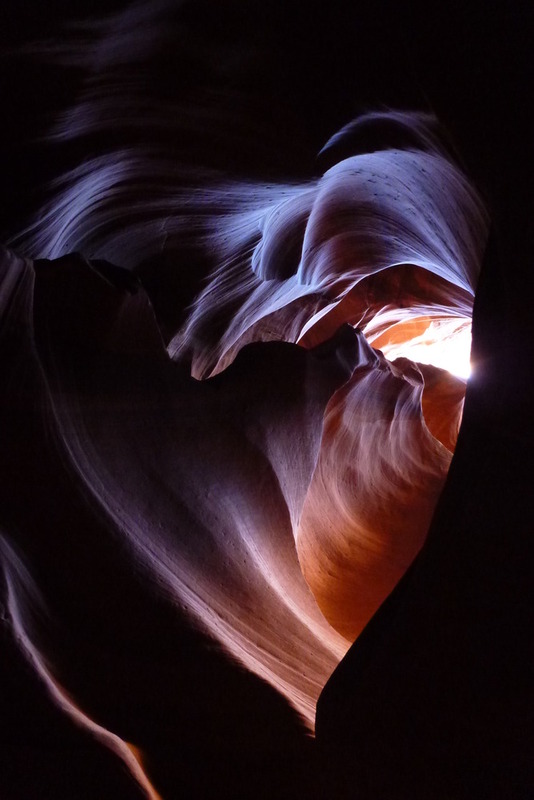 Once inside, we where blown away by a visual firework of sandstone shapes and warm colours of the setting sun that created an astonishing show only surpassed by the stories and musical performance of the guide. 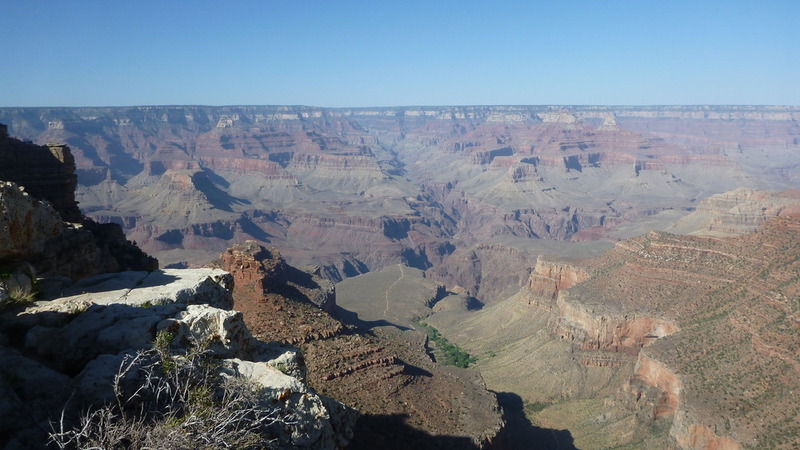 The canyon is only about 6000 years old formed by monsoonal flood waters up stream. As the rain waters travel down the valley and dam up in front of the canyon before screaming past inside the canyon towards Lake Powell downstream. 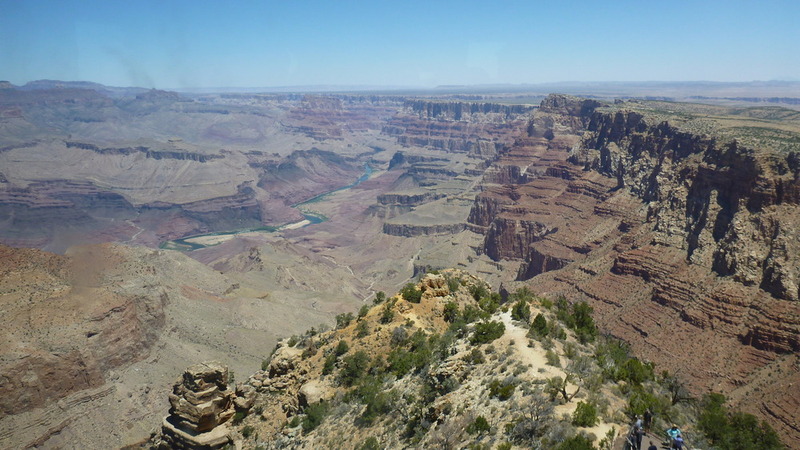 As a result it takes about 8 hours for the water to reside and water levels can reach up to 30 meters within the canyon. The force of the water is so powerful that it has eroded the sandstone into amazing shapes – whirlpools creating curved walls and lines. Our guide demonstrated the amazing acoustic qualities if the canyons by playing the traditional flute and later singing us a song. DB was brought to tears. 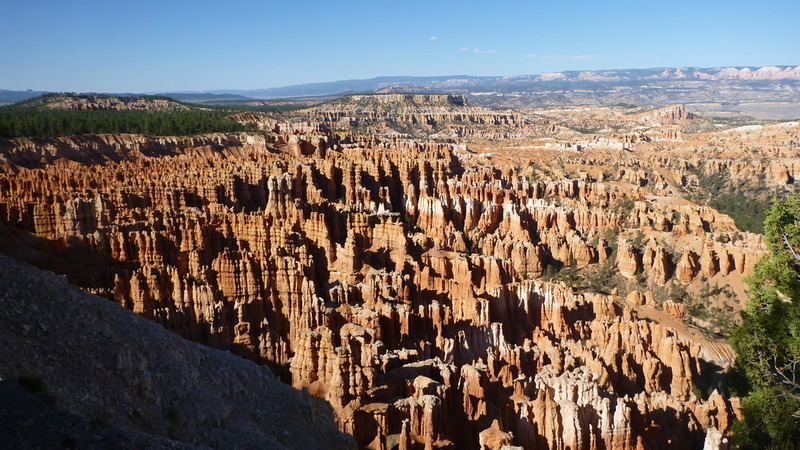 The canyons hold a very special place for the Navajo people as it was used countless times as an area of protection and safety during wars against enemies. It is also where the Holy People live therefore it is essential that you leave the place with respect. There are no words to accurately describe this place and the photos we took do not give it justice. 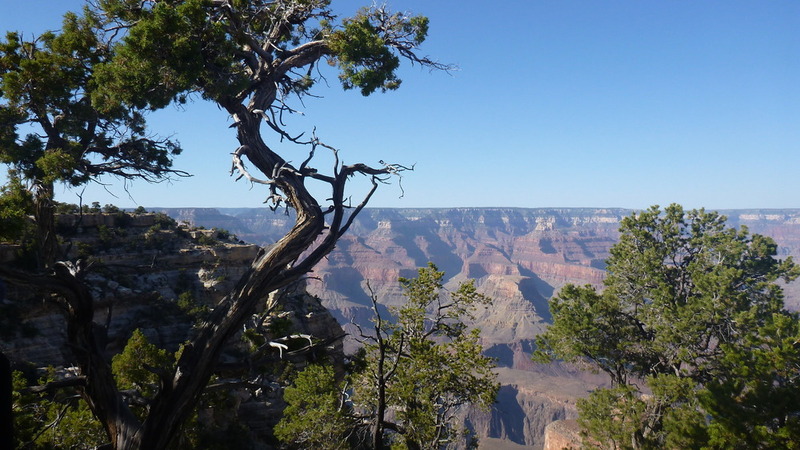 It is a sacred place and a place that everyone should visit when they travel through Arizona. It meant so much to us to be welcomed into the US by the traditional custodians and owners of this amazing land. Thank you Anne, for making us go! We set up camp under a warm evening sky dinning on spicy organic corn chips and salsa in one of the best camp grounds yet – unlimited hot showers AND electrical power points at your campsite with Wi-Fi! 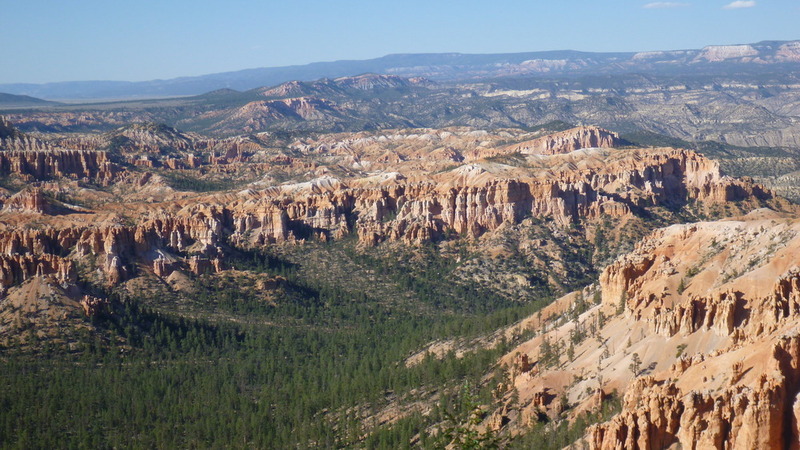 Next Team Berg head up north east to ride along Route 12 – the All American Scenic Byway towards Bryce Canyon and Archers National Park in Utah! After 3 days in Sin City we left the madness behind and successfully made our way out of Nevada and into Arizona. 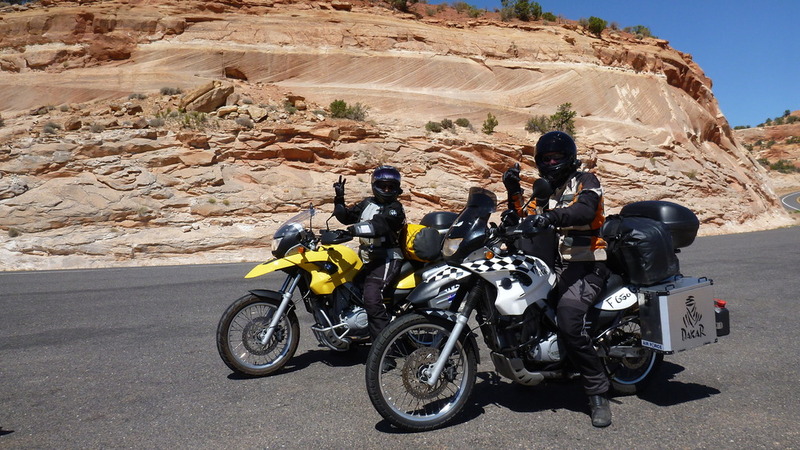 The plan was to meet up with Jeff who CB met in South America a few years back and his girlfriend Cata and ride together for a week or so and check out some of the best scenery Arizona and Utah has to offer. On the way east we stopped by the Hoover Dam, an engineering marvel built during the depression of the 30s. Pretty big, not as big as the Three Gorges Dam in China, but still impressive for something built 80 years ago. It is also the secret location of the All Spark for those Transformers fans out there 😉 We continued on our way, destination – Sedona. The ride into Sedona was challenging, to say the least with strong cross winds during the first half of the trip and some technical corners around Cottonwood during the second half of the trip. However the second half of the trip was some what surprising, after climbing several thousand feet we somewhat arrived at Cottonwood – a wee town perched on the edges of the mountain hugging the road like some Mediterranean village. By the time we reached the bottom of the hill DB was ready to throw in the towel and walk the rest of the trip, but hey, Team Berg doesn't give up. The day was long and stressful so we won't talk about it ever again. We met up with Jeff and Cata in Sedona and soon set up camp in Flagstaff. 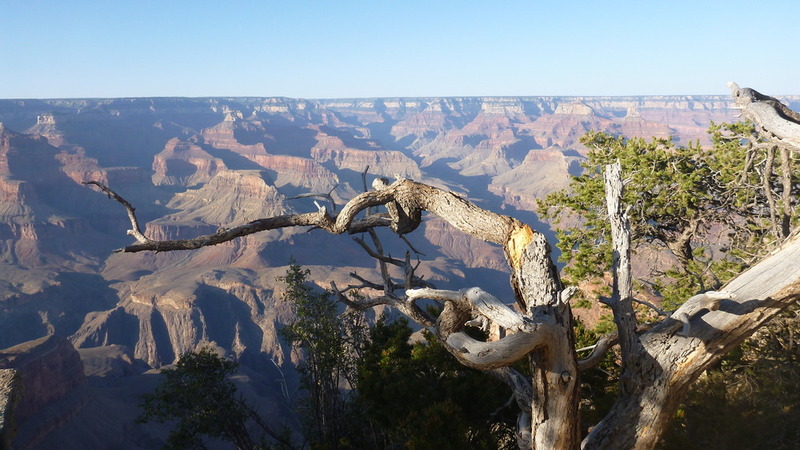 The next day we set our sights on getting to the Grand Canyon. Seeing the Grand Canyon was well worth all the struggle. It is just breathtaking what mother nature had teed up there for us. This was geology at work, right in front of our eyes. What a privilege to be here and see it with our own eyes. We waited till sun set and set up camp within the park under a billion twinkling stars in a beautiful pine forest. Best part of the day, besides the Grand Canyon itself was the hot dinner made by Jeff – Thai noodles and stir fried veggies – perfect end to a wonderful day. 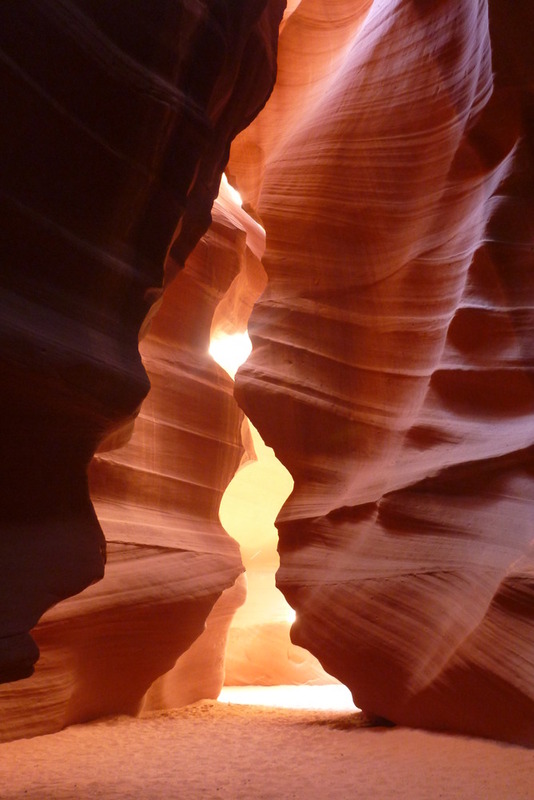 The next day after a yummy breakie of coconut french toast we headed north to Antelope Canyon.